Why was water such a popular commodity during this cool time of year? It's thought that honey bees use water to help dilute thick honey stores in the spring as well as to aid in flushing out metabolic waste, and raising brood requires a certain amount of humidity. The above video would suggest the algae both provided a good safe landing pad for the bees and held a good amount of moisture for the bees to drink from. It's no wonder beekeepers often take the trouble to try make their bees a specialized drinking spot. 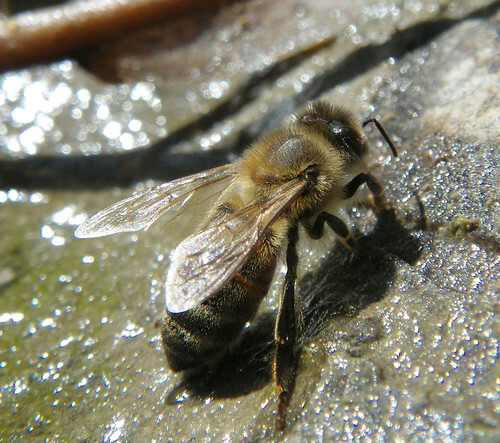 If you'd prefer your bees to use one source of water over another, a consideration particularly relevant to urban beekeepers who might operate near public pools, be sure to get them used to your source from the start of the season. 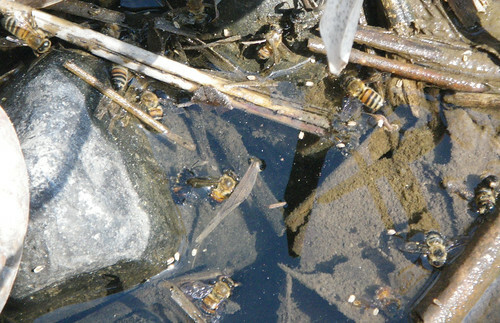 It's thought to be difficult to stop bees from visiting a water source once they have gotten used to it. For an unusual approach to keeping moisture in the hive in dry climates, check out the insightful experiment of providing water within the hive outlined here by Dennis Murrell of Bee Natural.